BoB button. All book images from Goodreads. Happy Monday, book buds! It's been another heck of a week in Shainaland. In the last seven days, I finally finished my first Jane Austen novel, Pride & Prejudice, for #AusteninAugust. There was sassy humor and unapologetic feminism galore, and I enjoyed it more than I expected I would. I also started and finished Station Eleven by Emily St. John Mandel. I can't believe I hadn't gotten around to it before; it gave me so much to chew on, and I'm excited to settle down and write about it. In non-bookish news, my boyfriend made it back safe and sound from his business trip, and it's been nice to have non-feline company again. (Amazingly, I did manage to do a couple of social things while he was gone, but Maude and I still got plenty of quality time.) To celebrate his being back, we promptly started bingeing Friday Night Lights together, which has been an excellent relationship decision so far. I also took my first GRE verbal and quantitative reasoning diagnostic and was pleasantly surprised by my baseline score. Those super top-secret life changes I alluded to? I'm *gasp* applying to graduate school! But more on that when we don't have a readathon happening, because Bout of Books 14 is obviously first priority right now. A week of reading calls for an enormous TBR pile! Of the above, I've only started The Book of Strange New Things, which already shows potential for being a pretty outlandish chunkster. 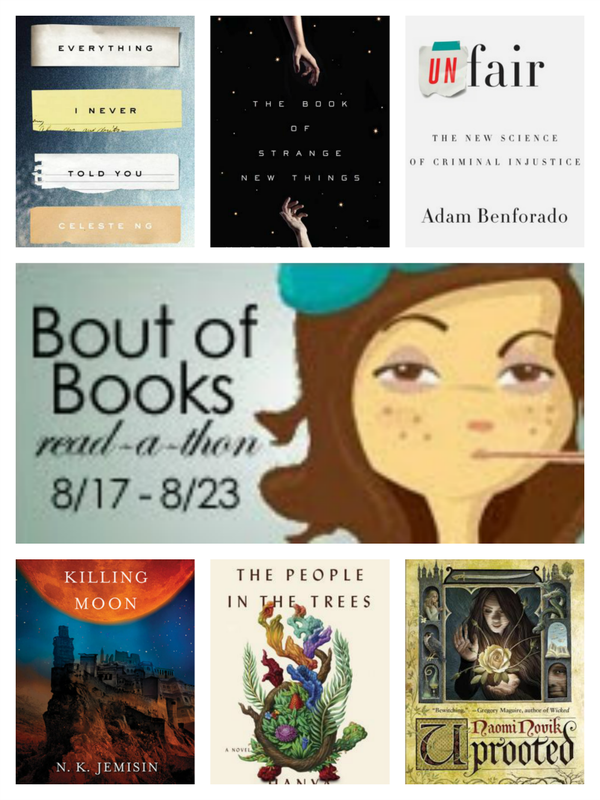 I also hope to get to Unfair: The New Science of Criminal Injustice by Adam Benforado (psychology and social justice? I'm swooning already) and Everything I Never Told You by Celeste Ng (also on the "how have I not read this already?" list). The rest are just a selection of books I've got on reserve for if/when I'm not feeling those first three. Happy Bout of Books, everyone! Are you participating? Either way, what are you reading this week?